Land Pride's new SBL25 is a front-mount Snow Blower designed to fit skid steers and tractors with Quick-Attach plates. It is a fully hydraulic unit—auger, impeller, chute and deflector—and features a 24-inch impeller and 16-inch auger. The auger features four paddles to direct snow into the four-blade impeller to direct the snow into the chute. Skid shoes are adjustable and replaceable. The SBL25 is available in 66-, 74- and 84-inch widths and features 3/16-inch side plate material, and 10-gauge main housing material. Willoughby Industries' all-new stainless steel high-efficiency urinal is fabricated from welded 16-gauge type-304 stainless steel. 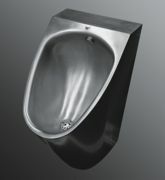 This high-efficiency washout urinal, model number UW-1317-HEU, uses only 1/8 gallon per flush. It also featured contoured interior and exterior surfaces for easy cleaning. Urinals mounted at 17-inch rim height complies with ANSI, ADA and UFAS accessibility requirements. This incredibly durable high-efficiency fixture is perfect for parks and recreation or any environment where vandal resistance is necessary. Competitor® has released a new lane line material with enhanced performance and durability. The new protective additive formula—named LifeSpan+™ —with cutting-edge polymer stabilization components and highly weatherable pigments delivers a superior product that will substantially increase the useful life of Competitor® discs in harsh pool environments. Developed in collaboration with the University of Akron Institute of Polymer Science & Polymer Engineering and A. Schulman, LifeSpan+™ is available only in Competitor-brand lane lines. New AmerBrite™ White LED Replacement Lamp provides a simple solution for aquatic facilities that want to replace Amerlite incandescent bulbs with new, energy-efficient LED lights without the hassle and cost of replacing the existing light fixture. The AmerBrite provides pools with improved underwater illumination and an energy-saving bonus. UL and cUL certified LED lamp uses only 34 to 51 watts of power. Available in 300, 400 or 500 watt equivalencies and both 120V and 12V versions. Aqua Creek's elite collection of new aquatic exercise equipment includes an aquatic treadmill, elliptical and four pool bikes. These superior products are a great supplement to fitness, hospitality and rehabilitation programs. Individuals looking for an efficient workout at home will also benefit from these products. The Shockwave pool bike is the most affordable and versatile in this collection, with a design that allows users to choose from six resistance levels. The optional recumbent seat provides back support. A new and improved DuraDrain® is now available to significantly improve the performance and longevity of playground surfaces. Testing has shown the new DuraDrain panels have 50 percent more resiliency and 75 percent more drainage capacity. It's still made from 100 percent recycled foam and is simple to install, since it comes in a lightweight 4-by-6-foot panel with a layer of geotextile fabric attached. Add DuraDrain to your next WoodCarpet® job along with WoodCarpet Mats® under high-traffic areas and extend your performance warranty to 20 years per AS™ F1292 fall safety standard. The Ephesus Visium series offers maximum flexibility and takes on the most challenging lighting conditions, including high ceilings, extreme temperatures, narrow aisle ways and humid pool environments. 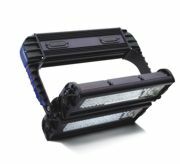 Built on proven LED technology, its modular design and mounting options put more light exactly where it's needed, at considerably less cost. This energy-saving, maintenance-free solution lasts far longer than any other legacy lighting while delivering the greatest light output available. Don't think that a quality scoring system is out of reach. Check out Sportable Scoreboards' complete line of affordable, state-of-the-art scoreboards, which includes the entire portable collection, featuring the top-selling portable models: the LED-4 and 2207. Sportable Scoreboards now has an outdoor multisport edition of the 2207 model that's perfect for organizations on a limited budget. Plus, be sure to ask about monthly specials, and don't miss new, discounted prices on select models.